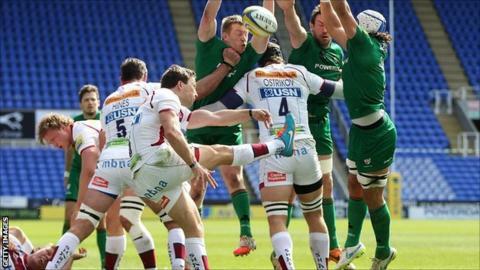 London Irish secured their seventh win of the season with victory over Sale. Irish led at the break through two Chris Noakes penalties and a converted Andrew Fenby try, with Tom Arscott and Mike Haley crossing for Sale. Danny Cipriani's penalty and Arscott's converted try took the score to 20-13. Alex Lewington then crossed twice for Irish and Noakes' second conversion put the Exiles five clear. Cipriani reduced the deficit to two points but the hosts held on for the win. The result is a setback to Sale's hopes of qualification for next season's European Champions Cup as they remain in seventh position, but lost ground on most of their rivals. Sale made the perfect start with Arscott going over in the corner after only three minutes but Cipriani missed the conversion. Noakes kicked over two penalties for Irish who later had Tom Court sent to the sin bin. Sale took advantage of the extra man with Haley going over in the corner after a three-quarter move found him in space, but Cipriani again missed the extras. However, Irish were gifted a try with Fenby intercepting on the Sale try line after a Noakes penalty had been fumbled and his conversion took the score to 13-10 at the break. Irish lost Blair Cowan after half time and Sale took advantage with 10 quick points - a Cipriani penalty and conversion after Arscott's second try. Sale's Chris Cusiter was the next player yellow carded and Lewington went over in the corner after good work from the Irish forwards to draw in the Sale defence. Topsy Ojo joined Cusiter in the sin bin and Lewington scored his second try, going over under the posts after breaking through a tackle and using his pace. Noakes' conversion took it to 25-20 and although Cipriani sent over a penalty with 17 minutes remaining the home defence held firm. London Irish head coach Glenn Delaney: "It was a massive boost, we were incredibly lucky and it was almost unbelievable to be gifted such a try. "It was a nip-and-tuck game but those seven points were game-changing. I'm proud of the never-say-die attitude of the players as we found a way to win a very close game. "The start didn't go according to plan but young Richard Palframan was outstanding at tight head. Our scrum took control and put us back in the game." Sales director of rugby Steve Diamond: "There were six experienced Premiership referees officiating in the Championship yesterday. "This was a massive game with livelihoods depending on it but too often our club are given inexperienced referees. "We should have had two penalty tries in the first half and for the critical try just before half-time, their player was 15 metres offside when the kick was taken. "We are good at home and have Newcastle and Harlequins to come but we've got to come and beat a side like Irish who are in a transition period." London Irish: Fenby, Ojo, Griffin, F. Mulchrone, Lewington, Noakes, Steele, Court, Paice, Palframan, Skivington, Rouse, Sinclair, Cowan, Guest. Replacements: Fowlie for Ojo (67), Stevens for Paice (74), Aulika for Palframan (46). Sale: Haley, Arscott, Leota, Tuitupou, Cueto, Cipriani, Cusiter, Harrison, Taylor, V. Cobilas, Ostrikov, Hines, Braid, Seymour, Beaumont. Replacements: Mills for Taylor (58), Jones for Hines (58), Lund for Seymour (58).